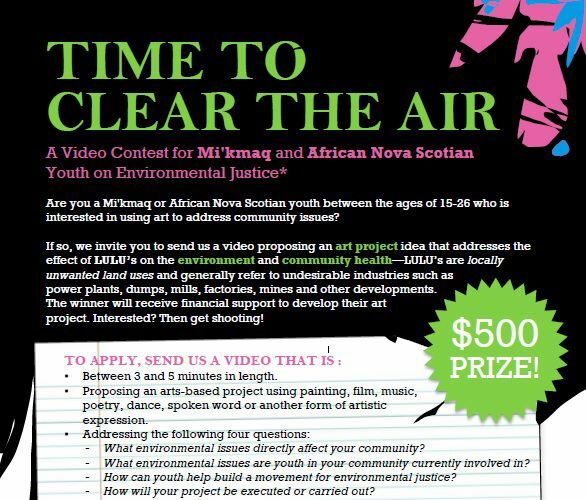 "Time to Clear the Air: A Video Contest for Mi'kmaq and African Nova Scotian Youth on Environmental Justice" invites young people aged 15-26 to submit video proposing art projects to address locally unwanted land uses (LULUs). K'JIPUKTUK, HALIFAX - They go by a sweet acronym but they’re anything but cute. LULUs, or locally unwanted land uses, have been disproportionately affecting minority groups in Nova Scotia, says a Dalhousie University-based research group. The ENRICH Project — that stands for Environmental Noxiousness, Racial Inequities and Community Health — is investigating the negative impact of industry on Indigenous black and Mi’kmaq communities across the province. Its theory? That “environmental racism” is prevalent in Nova Scotia. That is, these two groups are more often subjected against their will to the socioeconomic, environmental, health and political consequences of these industries. To test its hypothesis, the project has turned to the people directly affected. Last week, the ENRICH Project announced a video contest for Mi’kmaq and African Nova Scotian youth. The challenge: create a video describing an art project you would tackle about an environmental justice issue in your community. “We wanted to create a space, a venue for youth to be able to really just convey what their ideas for this topic were, how it directly affects them, how it directly affects their community and do that in a way that feels comfortable for them, that they have free rein in their artistic expression to be able to talk about that,” says ENRICH Project researcher co-ordinator Dave Ron. He goes on to say that youth “aren’t necessarily given the same level of credence or attention” as community elders or academic researchers, but that their artistic expression can be just as important a contribution to qualitative evidence of environmental racism’s effects. Gathering evidence on this topic from a variety of sources has been key for the ENRICH Project, whose researchers have taken a more grassroots — as opposed to ivory tower — approach. The project began last May with an NSPIRG-backed goal: to create a map illustrating the proximity of Mi’kmaq and African Nova Scotian communities to LULUs. It was inspired by a decade-long battle in Lincolnville, a predominantly black community in Guysborough County, against a first- and second-generation landfill. The map, which is still in progress, then morphed into something interactive, bringing together socioeconomic, geographic, health and qualitative data, such as anecdotes, oral traditions and personal narratives. It will eventually be a free online resource. Out of the map grew the ENRICH Project, which Ron describes as a “triad” of academics, community members and environmental justice organizations. He says the impetus for the project is for academics to provide the research and resources necessary to fuel communities’ environmental justice initiatives. To facilitate that process, the ENRICH Project held workshops in October (and continuing into November) in four Mi’kmaq or Indigenous black communities: Membertou First Nation, North Preston, Lincolnville and Yarmouth. Ron stresses that the ENRICH Project’s intention is not to act as a parachuted-in environmental justice superhero but as a “hub” connecting efforts across the province. A final workshop hosted in Halifax in January will bring together members from all five communities. The video submissions for the art contest will be shown and the winner announced. The competition is open to any Mi’kmaq or African Nova Scotians aged 15-26. Submissions are due Jan. 5, 2014. The winner will receive $500 to develop his or her project. Contest details are in the poster above.